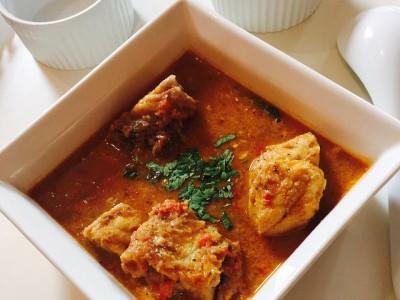 Fish chunks doused in a rich gravy with the super spices and amazing aroma.when it comes to Fish I always opt for baked or grilled Fish and it’s been long I was looking for Fish curry recipe which can really tempt me .read the recipe on net altered it a bit ,This south Indian style fish curry is perfect for any meal. Dry roast jeera seeds, fenugreek seeds and chana dal till they are lightly toasted,about a minute. In a blender, add this cooled spices,onion, coconut and make a smooth paste by adding water. In a non stick pan heat oil add curry leaves ,onion-coconut paste with green chilies let it cook for few min next ginger garlic paste mix it and add tomatoes, red chili powder cook it for a while and add fish ,glass of water. Turn off the stove when the the oil starts floating in the gravy.